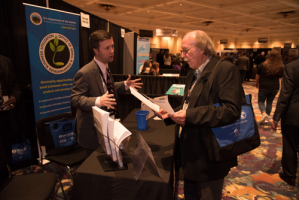 The RES 2019 Trade Show is transformed into a true Native marketplace, with vendors and businesses across a wide variety of fields on hand to not only talk business – but to conduct business. Showcase your business, products, and services to thousands of Native American business people and entrepreneurs with a booth at the RES Trade Show! Register early to secure your location. The National Center, as well as its PTAC and Native Chambers of Commerce, will also have their own sections to discuss their work and how you can be a part of the organizations. We are really excited about the 2019 Trade Show, and believe it will greatly enhance your RES experience. We look forward to seeing you in Las Vegas in March! The cost of exhibit booths are listed below. Cost to upgrade to a premium booth is $100. Premium booths are corner booths and booths located by entrances and food functions. Each booth, regardless of size includes two (2) complimentary exhibit hall only passes. Your booth passes are considered FULL CONFERENCE for Tuesday, March 26th and Wednesday, March, 27th. It will include all meals, networking events/receptions, matchmaking, sessions, etc. for Tuesday and Wednesday. Complimentary exhibit hall only passes can be upgraded to Full Conference Passes for $500 each pass. This upgrade is limited to the two (2) Complimentary Exhibit Hall Only Passes. One additional exhibit hall pass may be purchased for $399 for a maximum total of 3 per booth. Any additional exhibitor booth staff must purchase a full conference pass. A floor plan is available to select your booth location.